In Colombia, when the mainstream media and the government are promoting a wave of protests, expect to find a lot of television cameras using close-up shots. That’swhat happened on December 6, when people took to the streets in several Colombian towns with a common purpose: to march against the Revolutionary Armed Forces of Colombia, the FARC-EP. Now the oldest guerrilla organization in Latin America, dating to the 1950s, is essentially a terrorist group that recalls Marxist ideology when convenient. The “EP” in its name stands for “people’s army”—Ejército del Pueblo—but in reality most Colombians think of it as the people’s enemy. Close-ups at the protests were necessary, of course, because of the size of the crowds. The mainstream Colombian media attempted to portray the protests as a success, but in comparison with earlier protests against guerrilla violence in 2008, few took part this time. The trigger for the protest was the recent killing of four soldiers in the national army. They had been kidnapped between 12 and 14 years ago by the FARC and, despite negotiations, remained in captivity. According to the official story released by the Ministry of Defense, the soldiers were killed in cold blood with no other reason than a show of power by the new leader Timocheko, who took command after his predecessor, Alfonso Cano, died in a military operation in November. 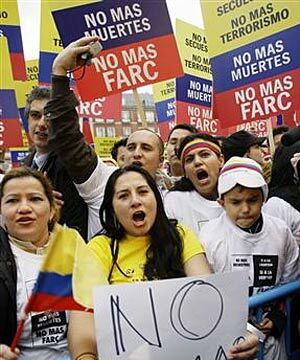 Protests against the FARC were first called for by families of the victims, and later supported by various civic organizations. The idea was quickly supported by pro-government media and the government itself. Opposition to the kidnapping frequently practiced by guerrillas was the main focus of the call for protests, though the FARC was the only identified target. It didn’t refer to any of the other armed groups that are still killing, displacing and recruiting young people all around the country. Those armed groups, once defined as “paramilitary” groups and pardoned by former President Alvaro Uribe through an obscure process of transitional justice, are now commonly identified as “emergent criminal bands” by the Santos administration. Hundreds of protesters took to the streets holding photos of their relatives kidnapped or disappeared by the guerrillas. As is often the case when a protest has institutional support, creativity and strategic thinking were largely absent. Entire families called on the FARC to free hostages and demobilize. But while the families were asking for freedom, humanitarian exchange, demobilization and reparation, another group of protesters insisted on the necessity of escalating the use of force against the insurgent group. This is a sentiment shared by Colombian President Juan Manuel Santos, who promises to “reach peace by the easy or the hard way,” and who took the protests as a reason to further strengthen the military for fighting against guerrillas. Thus, a protest against violence became, for the government, a chance to legitimize their frequently violent measures through the impression of public support. The protest, unfortunately, was a smokescreen meant to cover over another part of the reality: these killings didn’t happen without reason. According to a communiqué released by the FARC and supported by the silence a soldier who managed to escape, the killings were caused by the fact that military forces were mounting an armed rescue operation. Of course the presence of a rescue operation doesn’t justify killing captives, but what is clear is that the constant manipulation of information by the government aims to make it appear as if the execution occurred in a vacuum, denying that the Colombian military any part in it. For years, relatives of those the FARC kidnaps have been begging the government not to use violence to liberate the victims. The families and civic-based organizations have made it clear: the more violent the government’s actions are, the higher the risk for their relatives. In the aftermath of the protests, the FARC announced that a group of soldiers it is holding captive will be released in the coming months. Later, President Santos countered that the FARC must release all the soldiers and civilians that remain in captivity. The total number of them is still unclear, though local judicial authorities reported 229 kidnappings just in the last year, perpetrated by diverse armed groups including drug dealers, criminal organizations and “emergent criminal bands”—most of them with the goal of extortion. With or without government manipulation, the outcry against the FARC and its practice of kidnapping is loud and well-organized, not just across Colombia, but also in cities like Madrid, New York, Washington, Panama and Paris. Colombian people are tired of human rights violations and multiple simultaneous armed conflicts. But, unfortunately, people’s frustration is being used by the government to cover over its own historical responsibility for the bloodshed, and to justify the need for even more. Luisa Trujillo is a Colombian political scientist who has worked with Sudanese refugees and youth in Egypt. She currently works with forcibly-displaced communities in the pacific coast of Colombia. As a scholar of nonviolence, she also documents civil resistance in Bogotá.